It's hard to imagine that the next generation will grow up having largely never seen one of the best movies ever made. Released in 1981, Chariots of Fire was more than an Academy Award winning film. It was a masterpiece, and a celebration of a race masterfully run. Eric Liddell, the Flying Scotsman, was born in 1902 to missionary parents in China. He grew up in Scotland, attending boarding school with his brother while the rest of his family returned to China. His remarkable athletic gifts soon became apparent, and he was identified as a top contender for Olympic gold in the 100 meters. In the months leading up to the 1924 Olympics, Liddell learned that the 100-meter trials were to be held on Sunday. Unwilling to set aside his belief in the sanctity of the Lord's Day, Liddell shocked the sporting world by pulling out of the event. Though he was savaged by the British press, and even called a traitor, he firmly held to his convictions. He instead began training in the 400, a race he'd previously excelled at but for which he was not internationally recognized as a favorite. On the day of the finals, clutching a scrap of paper pressed into his hands by a masseur, Liddell again surprised the world with a record-setting victory. The paper read simply: "In the Old Book it says, ‘He that honors me I will honor.’ Wishing you the best of success always." Eric Liddell eventually returned to China as a missionary himself. He remained throughout World War II, and was eventually imprisoned by the Japanese occupiers. He died in captivity and in great pain from a brain tumor at the age of 43. 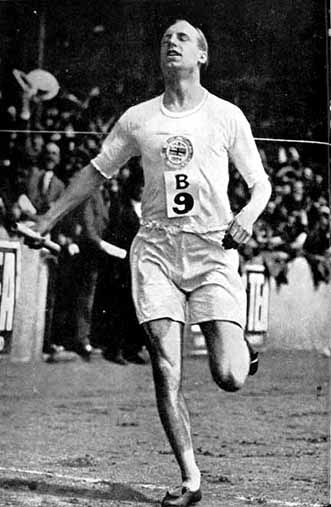 Eric Liddell was eulogized by his fellow prisoners: "His was a God-controlled life and he followed his Master and Lord with devotion that never flagged and with an intensity of purpose that made men see both the reality and power of true religion … Our friend, whose happy, radiant face … will surely live on in the hearts and lives of all who knew him." Thanks for honoring Eric Liddell, a man who's heart belonged to God. His faithfulness and commitment to the gospel needs to be remembered. Chariots of Fire was a great tribute to a man who ran the race at full speed in God's honor. I'd love to bring my one-man play, which tells the second part of Eric Liddell's story, to your church: RichDrama.com/BeyondtheChariots. I performed it in Hong Kong and China during the Beijing Olympics. Or you may be more interested in my play on The Acts, which features The Philippian Jailer: RichDrama.com/Acts. Thank you very much for posting that article. Chariots of Fire is one my all time favorite movies and Eric Lidell became an inspiration for me the day I saw the movie. Your comments convicted me that I need to show the movie to my children. The article is excellent too. Thanks again. Instead of complaining about low quality movies, we must share the great ones like Chariots of Fire. As the Chinese proverb says, "It is better to light a candle than to curse the darkness." For those not familiar with the story of Eric Liddell, I strongly recommend the biography, "Eric Liddell, Pure Gold". The book was written by David McCasland, who wrote the Award-Winning biography of Oswald Chambers. The publisher is Discovery House Publishers. ...appreciate these. Passed this one on to all of my contacts. If you are looking for further information about Eric Liddell we maintain an archive of information about him including the original film of him winning the gold medal in 1924 which you can view online. Just click on Eric Liddell at the top of the page.